The first model of photosystem (PS) II - a key part of the biological machinery that drives photosynthesis - has been constructed. The manganese and calcium cluster model reveals in unprecedented detail how PS II turns water into oxygen, a discovery that could lead to the creation of efficient catalysts for producing clean fuels. 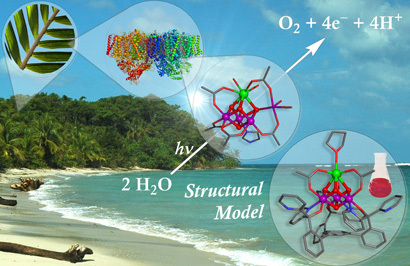 The oxygen evolving complex (OEC) at the heart of the PS II protein is where water is split using the power of the sun. It is the most important part of PS II, but is difficult to study accurately. Huge strings of protein surround the complex making it tricky to observe directly and previous attempts to synthesise PS II's core have been hampered by the formation of complex mixtures of oligomers. Now, Theodor Agapie from the California Institute of Technology and colleagues have simulated PS II's catalytic centre by making a simple, but large, ligand which surrounds the cluster with bridging alkoxides. This limits oligomerisation and allowed them to synthesise two isostructural cubic complexes. The metal atoms in the first complex are all manganese, but in the second - the best model of the OEC yet - one manganese is replaced by a calcium ion. Splitting water is no easy task. The consensus is that light provides the energy to oxidise the manganese atoms in the PS II cluster and this supplies the necessary redox power. 'Those oxidised species are hard to get to,' explains Agapie, 'but it seems that when you have a calcium there it's just much easier to get to that trimanganese +4 species.' In fact, redox potentials of the complexes with and without calcium differ by a huge margin. 'We think that's because the calcium is essentially stuck - it's not redox active - and so you can localise the higher oxidation state on the manganese,' says Agapie. Intriguingly, Agapie says their cluster does not appear to show any catalytic activity. He suggests this might be because the acetate ligands do not dissociate readily enough to reveal a binding site for water, and so tweaking the design could help. The natural OEC cluster includes an extra manganese atom known as the dangling manganese as it sits slightly apart from the rest of the complex. The absence of an equivalent atom in Agapie's model is also a potential explanation for the inactivity.